Last summer, in the rarefied, balmy climes of RM Sotheby’s Monterey auction, some brave soul coughed up around £5 million for the sole Aston Martin DB4 GT prototype. Even production examples are said to be worth about £3m, which makes the ‘continuation’ DB4 GTs currently being built by Aston Martin Works seem great value at around £1.5m a pop. But three lots before that Aston went under the hammer in California, a rare surviving example of the world’s tiniest car also made an enormous impact. 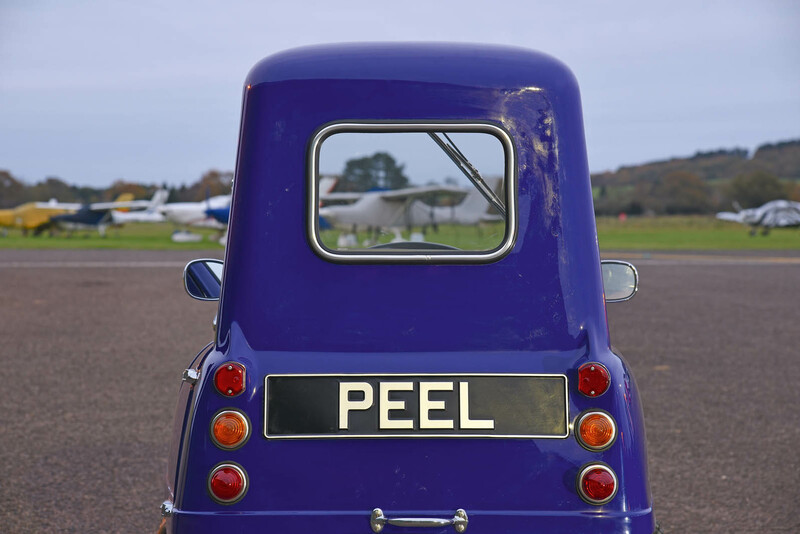 The humble, charming and frankly ridiculous Peel P50–all 54 inches of it– fetched just over £105,000. Not bad for a single-seat, single-cylinder three-wheeler with an original list price of £199. In fact, P50s have sold for more than £130,000. And unlike Johnny- come-latelies Aston Martin and Jaguar (with its continuation Lightweight E-Type and XKSS), London-based Peel Engineering has been producing recreation P50s since 2011. Starting at £13,679 – one- tenth of what an original might cost now – the ‘new’ P50 is arguably the raging bargain of the burgeoning continuation industry. Such a class-leading car mustn’t escape the Autocar treatment but, before we drive one, a bit of history. From its harbourside base in the town of Peel on the Isle of Man, the Peel Engineering Company wasa GRP (glass-reinforced plastic) specialist producing boats and motorcycle fairings designed for the likes of Nortons and BMWs. 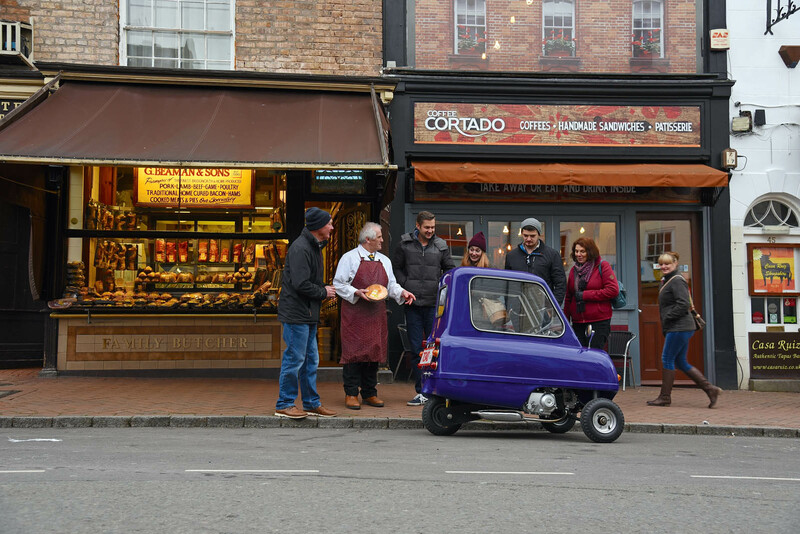 Dreamed up by the company’s founder, Cyril Cannell, the P50 was designed as a 40mph city car for one person (plus shopping), and was unveiled at the 1962 Earl’s Court Motor Show with one wheel at the front and two at the rear. The layout was soon switched, and with a 49cc two-stroke Zweirad Union/DKW engine driving the rear wheel via a three-speed manual gearbox, the production model was launched in 1963. Marketed as providing car comfort for moped costs, approximately 50 were built before production ceased two years later; only around half are still thought to exist. 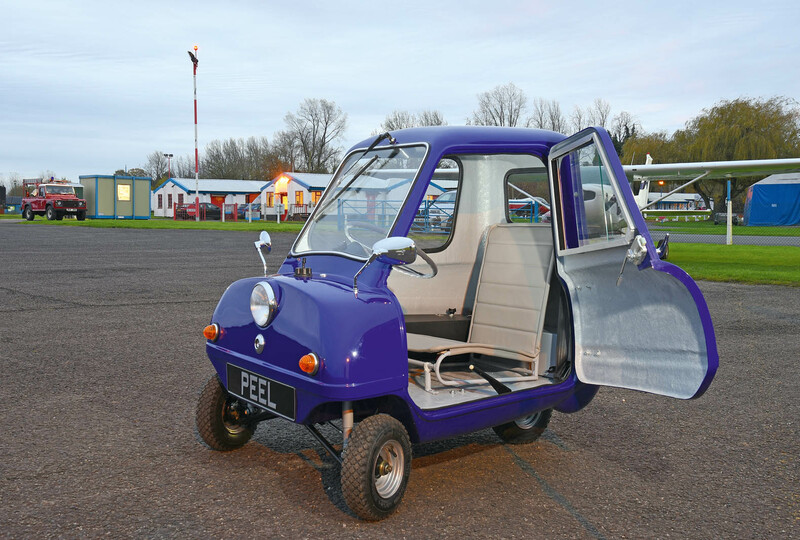 Frustrated by rising values of them, Peel enthusiast Gary Hillmansecured the rights to start building the cars once more under the newly formed Peel Engineering, which now sells around 15 P50s annually, plus 10 or so continuations of Peel’s two- seat bubblecar, the Trident. The traditional petrol version of the P50 is more popular in the UK and is priced at £14,879, while the car’s biggest market is the US, where the electric model (£13,679) circumvents emissions regulations. The company has customers around the globe, though, keen on the full Peel experience for a fraction of the price. They include the Crown Prince of Dubai, who bought five P50s and five Tridents (one for him and one each for nine shades-wearing, burly bodyguards travelling in convoy, I’d like to imagine), Abu Dhabi’s car-hoarding ‘Rainbow Sheikh’ and one owner who reportedly uses an electric P50 to navigate his enormous penthouse. As with the continuation DB4 GTs, the current petrol P50 is very close to the original in specification. Just like the similarly exotic BMW i8, the petrol P50 uses what Peel describes as a mid-mounted engine that sends its power rearwards through an automatic gearbox, has 50:50 weight distribution and achieves more than 110mpg. But unlike the BMW i8 – well, pretty much everything else. The one-pot, air-cooled Honda four-stroke motorcycle engine is actually sited below the driver and makes a full 4.8bhp at 10,000rpm, delivered to the rear wheel via a CVT and chain drive. Improving on the original, it comes with the luxury of a reverse gear. Single wishbones and dampers suspend the front, and there’s a rear trailing arm with coilover. Cable-operated drum brakes contain the P50’s 78kg mass, whichdoubles with me aboard. Top speed is 28mph. The diddy, one-piece GRP body is almost as tall as its 1371mm length and barely a metre wide. Entry via the single door for my 1.9m frame is a mystery until I’m told to reverse park myself then contort each leg into position. Buckled up on what looks like a legless dining chair, I feel like I’m wearing the car more than occupying it. 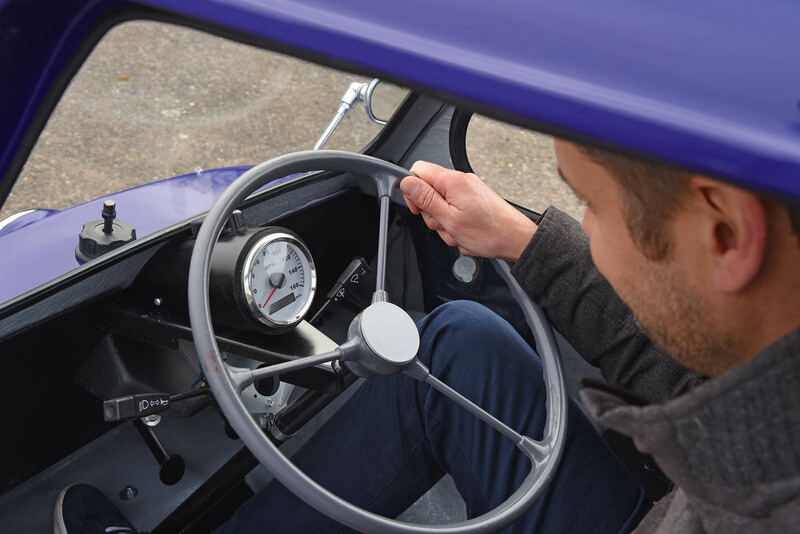 The oversized three-spoke steering wheel is set at around 45deg, yet feels almost horizontal. Straight through it sits the speedo, which goes up to a fantastically unlikely 160mph. Only a plectrum of carpet breaks up the expanse of primed GRP, and the switchgear is unsurprisingly rudimentary. There’s a spindly handbrake lever down to my left, tiny brake and accelerator pedals by my right foot and a chunky metal gear selector under my right leg, with choke, lights and starter button to the right-hand side. With so much glass, the view is excellent – apart from directly in front, where the wiper control juts down into my line of sight. A rear-view mirror would leave me staring back at myself, so there isn’t one, but the chromed exterior mirrors, poking up like antennae, give a good view behind. I slide down the seat to see the road ahead. Pushing the starter button sends the P50 into a loud, quaking fit that passes through me at every contact point as the noise of the phutting single cylinder echoes around the cabin. I clunk the shifter into drive and pull away for an exploratory toddle. With the CVT whining and clamouring for revs, the cacophony reaches a peak and stays there as the P50 zips forward. The steering is super-sensitive and corners must be taken gently, lest we topple over. The minuscule six-inch wheels – clad in Trelleborg ‘High Speed’ tyres – make every bump feel like a hill. Take a pothole on one side and the whole car cants over; foolishly try to nutmeg it instead and you’re quickly reminded of the rear wheel’s central position, so it’s best to steer around them. This is easy because, from the P50, a single-lane road feels wider than an empty autobahn. Stability becomes an issue at 20mph, so that’s our de facto top speed. With photographer Will Williams leading, we venture onto a Shropshire A-road, where I suddenly feel like a sprat crossing a major shipping lane. The vibration, sound and concentration going on in here allude to a double tonne, not a tenth of that, and every passing vehicle casts a shadow like a solar eclipse. Williams takes an unexpected turning and I stamp on the brakes. Not much happens, so I stamp harder, and eventually the P50 pulls up. Crashing from 20mph in a straight line would certainly have formed a career lowlight. We eventually reach Bridgnorth, where the P50 revels in its intended urban environment. No gap in traffic too tight, no bollards too close. If you can walk through a space, you can probably drive a P50 through it too. I can go as fast as everyone else along the busy streets and it’s truly an absolute joy to pootle about the town centre, beaming like a fool. People wave and small crowds gather when we stop. An intrigued butcher lends us a large steak and kidney pie with which to test the load space behind the seat (it fits). A few people know exactly what the P50 is, but most recognise the shape, correctly associating it with the free-thinking zeitgeist of the 1960s. Couple that nostalgia to the Peel’s friendly, flea-like dimensions and you have the ultimate goodwill car. 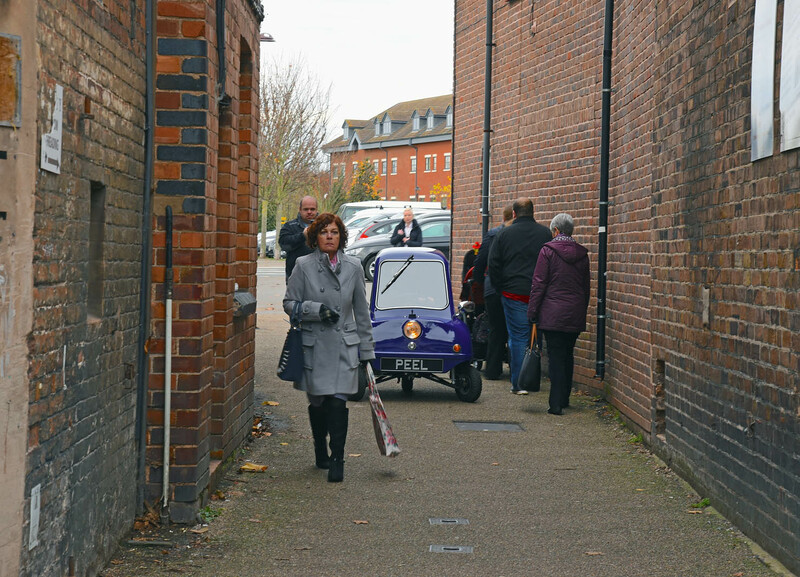 The Peel P50 is not a 15-grand mobility scooter – it’s a 4.8bhp happiness generator. BRUTSCH MOPETTA - Appearing six years before the P50 and reversing the Peel’s layout to drive two rear wheels while steering with a single front, the open-topped Mopetta was produced by microcar designer Egon Brütsch in Stuttgart. Its charming styling and hen’s- teeth rarity have prompted several replicas, including a run by British microcar specialist Andy Carter. FMR TG500 - Precluded from making aircraft after World War II, Messerschmitt based its family of three-wheeled Kabinenrollers (‘cabin scooters’) on the Fend Flitzer invalid carriage. Inheriting much of the Kabinenrollers’ design (including the two-seat tandem layout), FMR’s sporty Tg500 four-wheeler was a 494cc, twin- pot monster making around 20bhp. One was auctioned in 2013 for $322,000. FUJI CABIN - Another child of post-war aviation industry bans, the Fuji Cabin was made in Tokyo between 1955 and 1958. Though similar to the P50for its construction, suspension, brakes and Cyclops headlight, the Fuji Cabin’s 122cc, 5.5bhp single-pot was rear-mounted, its two seats were staggered and its 115in length made it a long-wheelbase leviathan. Utter foolishness and outright dangerous. Oh yeah, that's the car for me. A bit of pinstriping would do the trick. Seriously though, you'd be better off walking at a quick pace. It doesn't ap'peal' to me. Does it really need a suicide door? On a more serious note, if Peel can actually make a profit selling these things, then maybe the company has succeeded where many of the industry giants fail. And unlike the Renault Twizzy, at least the thing has side windows to keep out the rain. I quite like the idea of a really minimalist car, but this one just seems a tad dangerous! Good to see there are still buyers about with a GSOH. This is an expensive joke which gets old very quickly. I suppose economies of scale work in reverse also. It would be interesting to stage a competition amongst engineering students to come up with something better within the same overall dimensions. Four wheels and an electric motor, for starters. ...to avoid any reference to the Top Gear (TV) test of an original Peel back in 2007, which I suspect may have been another significant catalyst to the introductionof this continuation P50.